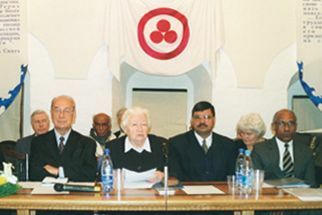 The conference organizers were the International Center of the Roerichs, the H. Roerich Charity Foundation, supported by the Russian Academy of Sciences Historical and Philological Department, the Russian Academy of Natural Sciences, the Russian Cultural Foundation, the International Association of World Foundations, the International League for Protection of Culture, the K. Tsiolkovsky Russian Academy of Cosmonautics, the Russian Federation of Cosmonautics, The UN Information Center in Moscow, the UNESCO Moscow Bureau, the Master-Bank. About 350 representatives from various regions of Russia, the CIS countries, and from Belarus, Bulgaria, Germany, Holland, India, Spain, Italy, Kyrgyzstan, Latvia, Lebanon, Mongolia, Poland, the USA, Ukraine, Finland, Czechia, Estonia took part in the conference work. They included 12 Academicians and Corresponding Members of national Academies of Sciences and specialized academies, more than 30 scientists with a degree of a Doctor or Candidate of Science. The conference was greeted personally by the Ambassador Extraordinary and Plenipotentiary of the Republic of India in Russia, Mr. Krishnan Raghunath, who highly assessed in his speech the significance of George Roerich’s and the whole Roerich family’s activities not only for India and Russia, but for the whole world as well, and told about the support which the Government of India provides in the cause of the Roerich family’s heritage preservation. President of the International Association of World Foundations A. Karpov, RANS President O. Kuznetsov, Director of Art Complex Karnataka Chitrakala Parishad (India) Nanjunda Rao also addressed greetings to the conference participants. The conference received greetings from Russian and foreign state and public organizations. The jubilee International Scientific and Public Conference “G. Roerich’s 100th anniversary” showed a high scientific level of reports and speeches and brought together a representative group of scientists specializing in the fields of Indology, Buddhology, Mongolian Studies, Tibetology, Turkology, Chinese Studies, History, Ethnology, Archeology, Philology, Geography, Art Criticism, Culturology, Philosophy, Psychology. They included G. Roerich’s direct students. <...> We are opening today jubilee celebrations dedicated to the one hundredth anniversary of one of the greatest Orientalists of the world, traveler, thinker – George Roerich. Opening today’s conference, I hope that it will be a success and will be held at a due level. For the man whose memory we honor today deserved a lot, and in the course of time, the tribute to memory will only grow. At least once a year, I try to come to the dear to my heart apartment of George Roerich which still contains manuscripts, books, paintings, and the spirit of his. But the atmosphere reigning there now makes a very depressive impression. And our common and my personal debt to George Roerich is to make at last his apartment where paintings by his father and brother are hanging, where his books are kept, property of Russia, an open for everybody memorial museum-apartment. <...> G. Roerich has numerous researches in the field of Indology, Tibetology, and Mongolian Studies. He equally brilliantly studied ethnography, religion, history, literature, and languages of the East, at that, most of his scientific developments were innovative in their character. Their depth, scientific authenticity, and strict logic explain their phenomenal urgency until today. In many ways, Roerich was a pioneer, and this statement refers to the greatest extent to his studies on Tibetology. <…> And now let me pass directly to the subject of my short speech. It is based on the article “Indology in Russia” which George Roerich published in 1945 in an Indian scientific magazine. In that short article, he managed to reflect the whole history of cultural and any other relations of Russia with India, starting from as early as the period preceding to the famous travel of Tver merchant Afanassy Nikitin (XV century). And what is the most important, he put the right accents. Many people, including me, believed at that time, and, probably, still believe, that George Roerich’s scientific interests were mainly focused on the area of the Tibetan language, Tibetology, and Buddhism, but, as it proved to be, his knowledge was equally extensive and profound in the sphere of Indology as well. According to Dr. George Roerich, this extensive literature has primary significance for the study of the Central Asian Buddhism. For proper understanding of Buddhism, knowledge of the Indian astronomical and astrological tantric terminology is essential. So, there were Faculties in monasteries where astronomy, astrology, and Sanskrit were studied. <...> The subject of major ethnic and historical migrations occupies the central place in scientific studies of G. Roerich, outstanding Orientalist, one of the founders of Nomadistics. G. Roerich dedicated to the range of problems of Great Resettlement of Peoples such studies as “Beast Style of North Tibet Nomad Tribes”, “Tokhar Problem”, “Memory of Tokhars in Tibet”, “Mongolia. The Conquerors’ Way”, still unpublished “History of Middle Asia”, etc. One of G. Roerich’s earliest studies – “Heyday of Orientalism” – can be justly called conceptual. A lot of factual material is contained in the expedition diary “Along the Paths of Central Asia”. <…> The “beast style” as a phenomenon of art goes far beyond a single chronological period. Beside the epoch of the first millennium B.C., we see its wide spread at the beginning of early Middle Ages both among nomad and settled peoples in the vast space from Central Asia to Scandinavia. <…> The “beast style” wide spread, its relationship with rich cultural expressions of various epochs allow to consider it as a synthetic revelation of culture.